Plan – Seek – Find: The Lane Cove Rivergaine 2 was a great success! 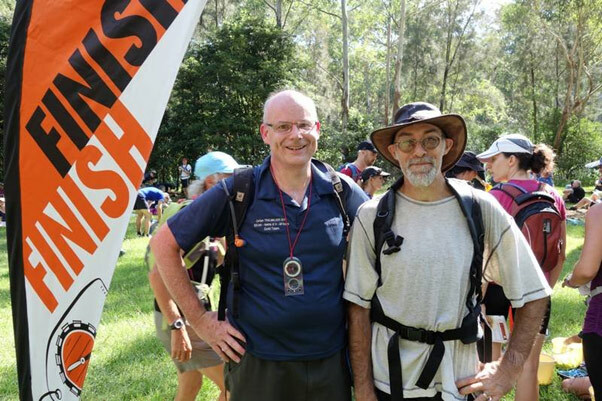 A speedy start to the 2016 season saw 6, of the 151 teams, find all the orange and white flags, as they looped around the Lane Cove River and further a field on Ted’s carefully crafted course. You can find the results, check out team routes on Routegadget, or Google Earth, and look at photos here. Chris, our webmaster, on the left, looks pretty happy. He must have been back on time! Chris entered the same event 21 years ago with his wife. This time with Chris Cunningham (on the right). This is a perfect introduction to rogaining. Come and explore the largest remaining bushland area in Sydney’s inner west, as well as playgrounds, cafes and shops. The most competitive rogainers/orienteers will also find some nice challenges if tackling the complete course. There will be a mass start at 12pm on Sunday 3 April at Earlwood Public School, and as is now tradition with the shorter city based events, solo entries are permitted. Notice of AGM: 3rd April @ 4pm following the Minigaine at Earlwood Public School. The NSWRA Annual General Meeting will follow the minigaine, and commence at approximately 4pm. The agenda will be on the website soon and least year’s minutes can be found here. Please email us if you have any business to raise. Our sport depends on people contributing time and energy to the organisation of our events. See the volunteers' calendar and if you’d like to put your hand up, or know more about roles please get in touch with Dale at [email protected], or contact the event organiser. Not ready for a major role, how about helping out as an assistant to the registration team or event organiser? We are still also looking for an E-newsletter contributor to coordinate these e-bulletins. 2016 Intervarsity University Championships are fast approaching! The 2016 Intervarsity Rogaining Championship will be held in conjunction with the ACTRA Rogaining Championships on the weekend of 30 April/1 May. The event location is the Shoalhaven River headwaters (2 hours from Canberra). Each year the Nigel Aylott Memorial Sports Foundation (NAMSF) supports university students to enter the event. NAMSF was set up in memory of Nigel, a keen adventure racer and rogainer, to encourage engagement in these outdoor sports. Details of NAMSF subsidies will be available shortly. These subsidies will assist uni teams with travel and entry costs for the event! The Intervarsity Rogaining Championship is open to all university students (full-time, part-time, undergraduate, or post-graduate). Students in a team must be from the same university. If you are NSWRA member and a uni student, start talking to your uni friends about how much fun Rogaining is! Please send Gill a quick email on why your team should be selected for a subsidy by 1st April. Alternatively, if you are a uni student, but unable to find a partner please email us, and let us know your Rogaining experience and university you attend as we can hopefully find you a teammate! Anyone can enter! Click here... to go to the event website. More than 600 rogainers from Australia, New Zealand and around the world have entered and will be heading to the Ross River Resort in the East McDonnell Ranges, (an hour from Alice Springs) on 23 and 24 July 2016.